They carried placards, which had inscriptions that protested the relocation of the prisoners including; Enough is enough, we demand the relocation of Boko Haram prisoners from our state, Is this the dividend of democracy? Among others went round some areas in Awka. They stated that since the said relocation, trading has grounded in Aguata area while investors have started relocating out of the area, just as fear have crept into the entire Ekwulobia, leaving markets in the area near empty as people now fear to go into public places like markets. National President, Dr Jude Okolo who read the communiqué co-signed by ASATU National Secretary, Peter Nwagu said it received with shock, embarrassment and disdain the news of the relocation of the prisoners through the Nigerian Prisons Service. It stated that the people of the southern part of Nigeria, particularly the South East were the first target of the deadly group, killing, maiming and displacing the people and also destroying their places of worship, businesses and places of social gathering. 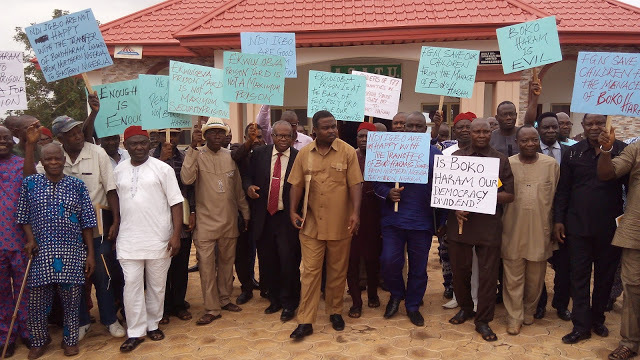 Okolo said the relocation was not well thought out, and was ill conceived, ill considered, grossly insensitive, condemnable and therefore totally unacceptable to them. He said if it is not, why will the insurgents be relocated to a place that was not within the jurisdiction of their activities as they were still awaiting trial. “The Ekwulobia prison is a minimum prison located in the middle of a densely populated community which is surrounded by tertiary institutions and therefore grossly inadequate for such inmates of high security risk. “There is no military presence in the case of recurrent emergency of prisons breaks associated with the Boko Haram insurgents. This is in flagrant disregard of prison convention and best practices worldwide. The courts in Anambra State have no jurisdiction to try them for offence committed in other states, so why are they bringing them here?” They asked. It further stated that the continued presence of the prisoners is a trauma too many for Ndigbo who have not fully recovered from the physical and psychological trauma of the past and recent pasts occasioned by gross maltreatment from some fellow Nigerians in different part of the country. Also reacting, President-General of Ekwulobia Town Union, Rev. Dr. Ezeike Chukwuemeka laments that the residents of Ekwulobia are currently relocating to other communities because of fear of the Boko Haram suspects deposited in their domain without due consultation. Ezeike, who further alleged that economic activities in the town had been crumbled as markets closed down indefinitely, accompanied with sleepless night and hardship trailing his people, appealed to the federal government to relocate the Boko Haram prisoners to a place close to where they would be tried.